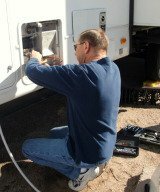 Where is the fresh water drain for a National RV Dolphin 2001 motorhome? I am not sure where it might be exactly but have you looked underneath where the tank is? Ours is underneath the camper on the bottom of tank.